This copy of Shakespeare’s First Folio was sold at Sotheby’s in July of 2006. A London bookseller purchased it for £ 2.8 M. Estimates for the sale were up to $ 6M, so someone got a wonderful deal; too bad it wasn’t me. It was sold to a bookseller, which suggests it was sold again, to an anxiously waiting client. Such is the nature of the world of rare and scarce books. This particular copy wasn’t even complete. One of the front endpapers was missing and the original Ben Jonson poem was replaced with a 19thC copy, which suggests someone cut it out and sold it – sadly, that’s a common occurrence. 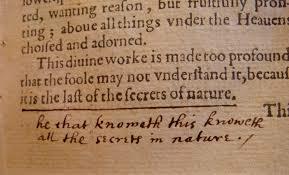 There are scribbles in the margins, too, circa the 1600s, with comments like “simile,” as though some 17thC school child was reading it for a homework assignment. All this acts to bring down the worth of a collectible volume, which may be why it went for under expectation. But hey, I’ll take it for Christmas, if you’re looking for something to get me. There are somewhere around 200 copies of this First Folio volume in existence, which makes it technically not even rare, but the bulk of those books are in university, museum and private collections. Original 1623 editions don’t come on the market very often. The only people with access to most of the other copies are scholars, or those given special permission to handle the books. Someone took advantage of this rare opportunity. A wise person. Rich and wise. Wouldn’t you just love to touch this book? To lay hands on this piece of literary history? Then again, if I owned it there’s a high possibility I’d find some way to ruin it. Inadvertently, of course. I purchased a book about the early history of Manhattan and, trying to open the map to see if my Dutch ancestors’ land was recorded, I accidentally ripped it. It’s been in near-pristine condition since the early 1800s. In a few short days I managed to remedy that. A few short days. In my frustration, I ripped it even more, trying to tuck it back into the book. As if that weren’t enough, I Googled maps of Dutch Manhattan and found there’s a great one online, so that book gave its life needlessly. This is why I should never be allowed to own nice things. 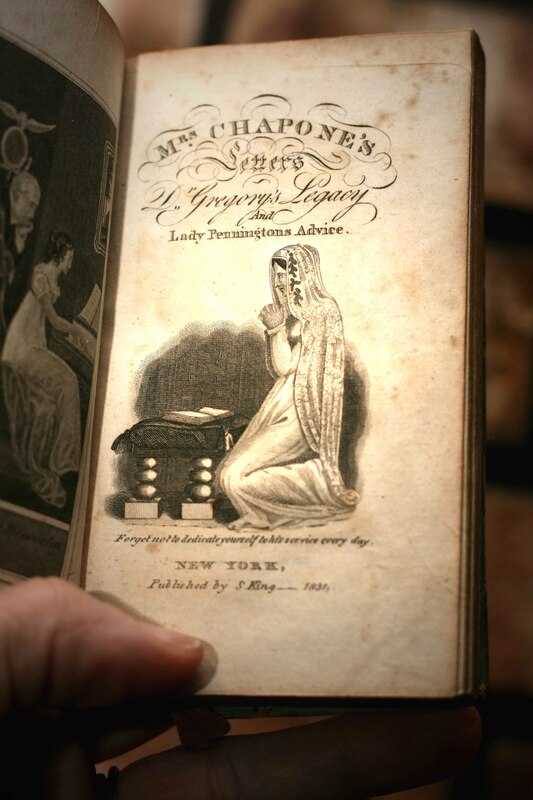 I have a few older books in my own collection, the oldest dating to the 1700s – pre-Revolutionary War. It’s a drama by Pierre Corneille, the French playwright. When I purchased it I only wanted it for its age. I’m not fluent in French, not that I planned to read it. I wanted something old that was affordable due to obscurity and condition. 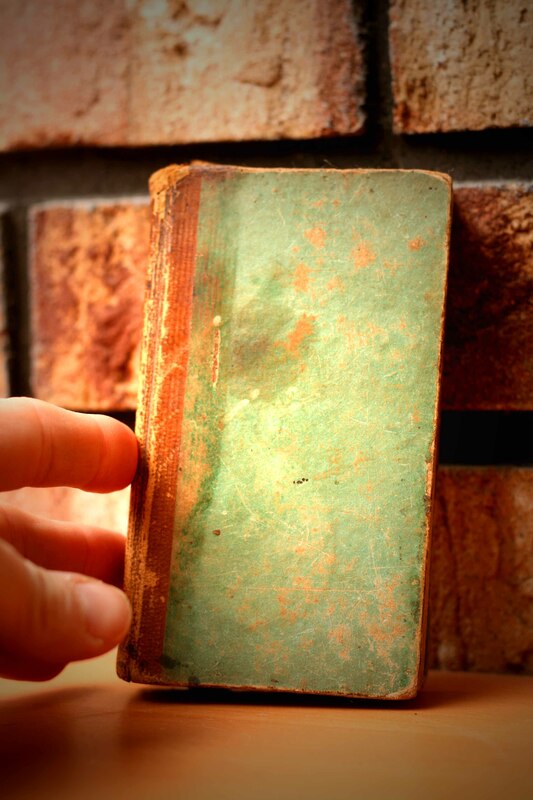 And that’s what I got, an old book I couldn’t read, with a crumbling spine, a lot of wear and foxing. I don’t recall what I paid but I bought it via eBay, that most fertile ground for finding antique books (caveat emptor…). The book was published in New York in 1831 and written by, what do you know, a true bluestocking: Hester Chapone. My heroine! Bless her, and her compatriots, for bucking the system, one which looked upon women as unfeminine – and worse – for daring to educate themselves. Earlier women, such as 17th C playwright Aphra Behn, were called whores for earning income by writing. Because women, “real” women, stayed home to spin and keep up the household (i.e., order the servants around) and never, ever earned money. How vulgar. Women could certainly bring a dowry into a marriage, that was expected. She could only bring more money into the family if a rich relative died, willing her land or other assets. Of course, all she came into possession of reverted to her husband’s ownership. Nothing belonged to her and, in all but rare circumstances, money and property passed through the male line, leaving women to hope they’d been left enough money to live on for the rest of their lives by the generosity of their husband’s will. Another gem of my collection is my first edition set (all novels were published in multiple volumes in the 18th century) of one of Fanny Burney’s books (18th century), Camilla, from a circulating library, the most famous member of which was a certain Jane Austen. Did she actually touch these books? Was this the set she borrowed and read? Probably not. But I can dream. In the 18th century books were so tremendously expensive your average middle class family couldn’t afford to own very many, thus the popularity of these circulating, or lending, libraries. The choice was basically either feeding and clothing your family or owning books, so most middle class families chose the former. However, for a more reasonable fee one could sign up for a circulating library and virtually rent books. Even these would have been somewhat expensive, making it more cost-effective for all readers in the household to pass them around before they were sent back. Then the next set of books would be sent, and so on. Imagine a cross between the Book of the Month Club and a library. That’s the circulating library. Book history, library history… I’m kind of a nut for all that stuff and my personal library reflects it. I’m the nerd who bought an incredibly obscure history of the library, during some period of time I don’t remember to some other, from Half Price Books. I’m the reason they stock stuff like that no one else on earth wants to read, the one who tries to out-wait them, picking up the unwanted esoteric titles for a buck (but paid more for the history book) when they hit the clearance shelves. I bat clean-up for Half Price Books. You got me. I’m a nerd, through and through. When I leave this earthly realm I hope the sum of all I will have collected winds up in the hands of another bluestocking – or whatever you call the male equivalent. Bill Gates? More likely, on the way home from my cremation my family will pull a truck up to the doorstep and load ‘er up. Here you go, Half Price Books! TAKE ALL THIS CRAP. Know what I need? Someone to cultivate with all my weirdo interests: an Estella, a person who won’t separate my library but will take all the crumbling spines up to the brand new stuff and give it a home. And wow, this got morbid, didn’t it? All because a Shakespeare First Folio was auctioned off in 2006 and I have a few dusty, old books. Now, let that be a lesson to you. Insert the moral here and we’ll call it a day.